More than eleven years ago, long before Paul and I had kids, we took a trip to New Orleans for our five year wedding anniversary. We had a wonderful trip, and one of the fun things we did while there was go to a cooking class. The chef was a very large man, who made gumbo, jambalaya, and Creole pralines. Everything was wonderful. I remember during the class a lady raising her hand and asking, "Are you using whole milk in that? Could I use skim?" and he replied with great mirth, "DO I LOOK LIKE I USE SKIM MILK?!? If you want it to taste good, you use whole!" and the whole class laughed. I saved the recipes that we made in the class all these years, even though I have never recreated them at home. But after my recent success with the candy thermometer in making English toffee, I decided I was ready to attempt the pralines. I poured myself a glass of white wine and rolled up my sleeves. Combine all ingredients and bring to a "softball stage" of 238-240 degrees, stirring constantly. Remove from heat. Stir until mixture thickens, becomes creamy and cloudy, and pecans stay suspended in mixture (I think this took me longer than expected - maybe 8 minutes or so). Spoon out on buttered wax paper. Makes 1-50 pralines, depending on size. I was pleased these turned out. I took them the next day when I volunteered with Barn Cat Buddies to help make raffle baskets for their upcoming fundraiser. They were quite a hit! Maybe next I'll try my hand at the jambalaya. I make jambalaya frequently, but have never tried the version from the cooking class. They look amazing -- and I agree with the chef -- sometimes you just gotta use the good stuff! Those look great!! I can just imagine how good they taste. I have made jambalaya before and it turned out so good. I think I only made it once and am not sure why. Wow! These look awesome! They will be a big hit at the raffle! Wow those look great !!!!!!! !have a wonderful day Lisa !!! those look reeallly good. Love that Chef's attitude :-) He's right! Another one that looks Yummy!! You are one Home-makin' Mama!! Kudos to you! Oooohhhhh! This is my favorite candy! Thanks for sharing this recipe. Have a wonderful Christmas with your family! THESE LOOK DELICIOUS. MY HUSBAND LOVES JAMBALAYA TOO! Yum!!! 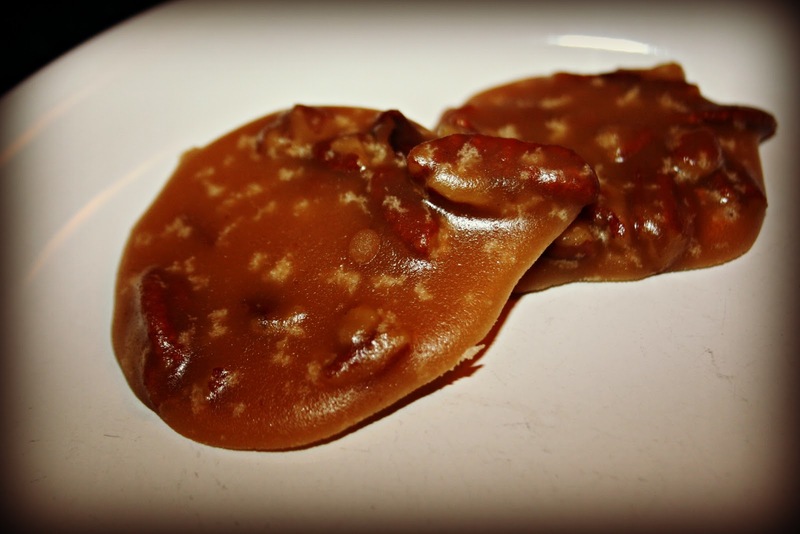 Love love love pralines - I'm thinking I might need to try this one. Those look amazing! They look easy to do too! Those look soooo yummy! Totally agree, I use whole milk in all my baking. pinned it, love pralines, yum yum! D and I went to New Orleans for our first vacation. I gained 5 pounds. Nuff said. They look beautiful! You are a really adventurous cook! haha...i agree with large chef man!! my mom always asks if she can use margarine instead of butter. i always reply, "sure, if you want it to taste like crap"!! I bet the boys just love this!!! I still have recipes from a cooking class I took. Unfortunately it was not in New Orleans, what a great memory! I am not making any Christmas goodies this year because the Hubs is trying to cut down. His Mom makes enough for everyone so he at least gets some treats. Those look better each time I visit this page. The pralines look yummy! It always makes me nervous to boil sugar on the stove, though. That little glass of wine helps the candy making process! I can't wait to make these. Thank you for posting! I know have to be delish with the recipe from New Orleans. A friend once sent me some from there, and I have to admit, I ate way too many. Don't you find that most of these chefs use lots of butter, sugar, milk and salt in their cooking? But it usually does make it taste better. I remember these from my trip to NOLA, years ago. They are so delicious. Yours turned out great! Lisa, these look delicious. If I make them, I'll be sure to use whole milk! :-) wishing you a very happy Christmas! I definitely want to try to make these, they sound delicious!